Mahayana sutras are a very broad genre of Buddhist scriptures that were originally put in writing starting in the first century BCE. They form the basis of the various Mahayana schools. 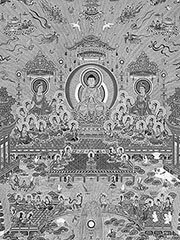 Mahayana Buddhists believe that these texts, with the exception of those with an explicitly Chinese provenance, are an authentic account of teachings given during the Buddha’s lifetime. However, Theravada Buddhists believe them to be apocryphal. Tibetan Buddhists generally divide Shakyamuni Buddha’s exoteric teachings into three general categories, known as «turnings of the wheel of dharma»—the Hinayana, and two Mahayana turnings: the Prajna Paramita (Perfection of Wisdom), and the Tathagatagarbha (Buddha Nature) teachings, respectively.